The area around the rink has been evacuated. Fernie Memorial Arena in Fernie, B.C. where three people died after a suspected ammonia leak while they were completing maintenance work on Wednesday. The mayor of a small city in southeastern British Columbia says three workers were doing routine maintenance at the ice rink when they were killed by a suspected ammonia leak. Fernie Mayor Mary Giuliano has not identified the dead, but says two of them were local residents. 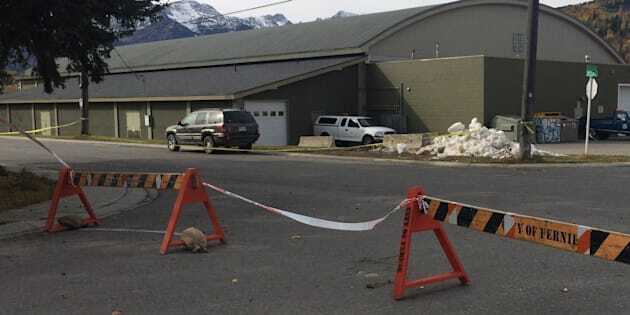 The third was an out-of-town contractor for the company handling maintenance on the ice-making equipment at the Fernie Memorial Arena. A state of emergency remains in effect in Fernie after the leak, which happened just after noon on Tuesday. Giuliano says it was imposed to assist about 60 people living near the arena to leave. RCMP are investigating and WorkSafe BC, which investigates workplace accidents, has been informed. Experts from the Environment Ministry and CIMCO Refrigeration are also at the scene. A memorial sign and flowers sits outside Fernie Memorial Arena in Fernie, B.C. on Wednesday. Giuliano says the accident has devastated her East Kootenay community. "We are a small town and everybody knows everyone and there is a lot of wondering who it is that we might know, so it is affecting everybody,'' she said Wednesday. Watch: Fernie, B.C. resident calls the deaths an "awakening"
Fire Chief Ted Ruiter said there were no other injuries. Ammonia is commonly used in mechanical refrigeration systems, including those found in ice rinks. It is used in liquid form in such systems but becomes a gas once it is released into the air. The Canadian Centre for Occupational Health and Safety says ammonia is a colourless gas that is toxic if inhaled. Symptoms of ammonia poisoning may include coughing, shortness of breath, difficulty breathing and tightness in the chest. The centre says symptoms may develop hours after exposure and are made worse by physical effort. In addition to being used in ice rinks, ammonia is used in fertilizer and to make plastics, fibres and other chemicals.